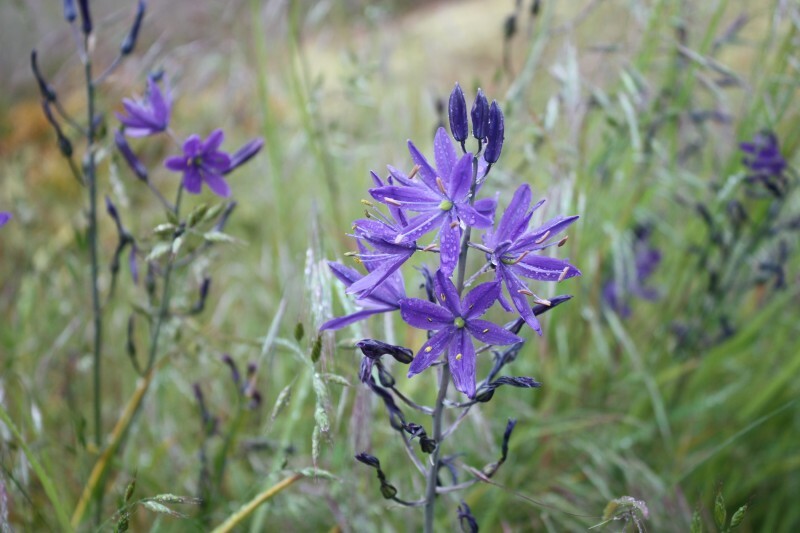 This is the Camas, the flower of one of the many “Roots” that the Natives dined on. The bulbs of these plants and of the other plants that grew in this district were carefully harvested and roasted, before being stored for winter food. I see I have forgotten to include the two journals that cover the short section of the Columbia River east of the Cascades, to Fort Nez Perces. It is time to correct that error. At 4 o’clock AM we pursued our voyage, and in the evening passed John Days River, and encamped a few Miles above it. In our progress to day we saw several small parties of Indians who appeared from their reluctance to part with their salmon, to be not very successful. The excessive heat experienced these two Days has tended much to spoil our fresh Fish, part of which it was necessary to throw away, and a bare sufficiency remains for tomorrows consumption. John Days River is often mention in these journals, and according to Bruce McIntyre Watson, was “two rivers running into the Columbia… The first runs through Gilliam, Grant, Jefferson, Sherman, Umatilla, Wasco and Wheeler Counties and the second through Clatsop County.” This John Days River will be the first of the two above-mentioned rivers, and it is spoken of many times in the brigade journals that exist, and in the York Factory Express journals. John Day was a tall strong man, born in Virginia in 1771. 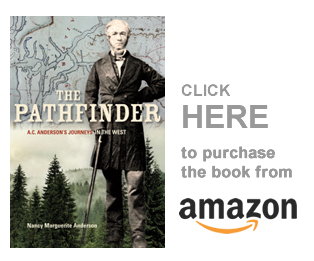 In 1810 he joined Wilson Price Hunt’s Overland Expedition to the west, as hunter for the Astor Company. In 1811 the Expedition reached the Snake River and built canoes to come down to the Columbia. It was a disaster: one man drowned and they lost all their provisions. The party of four or so men struck out on foot for the Columbia, along the banks of the Snake, but got lost when they couldn’t make it through the canyons and were forced to attempt another route. They almost died of thirst, and because they had no food they ate their beaver skins, and their shoes. Day fell ill, and the Snake Indians took sympathy on him and his companion and shared food when they could. The pair wandered for some two months until they came on the Umatilla River, where they were found by Nez Perces Indians, and rescued again. On their way down the Columbia they were robbed of clothing and possessions by unfriendly Indians, and were rescued for the second time by the Nez Perces. In May 1812 they once again reached the Umatilla River, where they were discovered by the Astorians and taken downriver to safety. Day then began a journey across the continent to the east, but at his campsite on the Columbia he suffered a complete mental breakdown and attempted to commit suicide. Some friendly Natives again rescued him, taking him down to Fort George where he presumably recovered. In 1814 he left the territory with the outgoing canoes, but later re-entered the NWC’s service and died in the Idaho area in 1820. 13th Wednesday. A fine aft Breeze throughout the day assisted our progress very considerably. Several Bands of Indians were seen Encamped by the River who appear destitute of every species of food excepting Roots which this Country furnishes in considerable variety & abundance. The weather continues fine. 14th Thursday. The wind was again in our favour, and enabled us to proceed with much greater distance than we could have done without its assistance. Encamped above the Grand Rapid. Weather the same and heat excessive. The Grand Rapid is the Umatilla Rapid. This was a long and dangerous piece of water that ran through a narrow canyon with perpendicular walls, 18 miles below Fort Nez Perces and a few miles above the mouth of the Umatilla River. It, too, is often mentioned in the York Factory Express journals. Obtaining enough horses for the use of the brigades was always a problem, but in later years they solved it by sending the boats upriver under the charge of one clerk, while the Gentlemen rode to the camps and traded for the necessary horses. These they would then drive across country to Fort Okanogan, where they would join the horses that had carried the HBC men south from New Caledonia. Of course, the Nez Perces horses were entirely unbroken, so loading them with packs at Fort Okanogan was always an interesting experiment. So William Connolly has reached Fort Nez Perces in good time to continue his journey north. Let us see what happens in Peter Warren Dease’s 1831 journal. Peter Warren Dease is the older brother of John Warren Dease mentioned above. This is a very short section of journal: no wonder I overlooked it. Thursday 7th [July] After sunset put up near John Days River. Very warm weather. Friday 8th. One of the the Boats was broken Considerably to day by another coming in Contact while under Sail, lost 3 hours repairing. Had a Strong aft wind most of the day. Saturday 9. Very warm day. Put up opposite Big Island, 2 dishes lost on the way down were found & brought by the Natives — were recompensed for their honesty. The Big Island is Blalock Island, one of a pair of Islands in the Columbia River 170 miles from Fort Vancouver, more or less. The Natives mentioned here would have been rewarded with Tobacco and perhaps ammunition: items that were probably more important to them than tin plates, which is probably what the “dishes” would have been. Sunday 10. The Weather very warm. One of the men (Joyale) fell over the side of the Boat & hurt himself — off duty. Monday 11. Arrived at Fort Nez Perces at Midday. Delivered the Outfit of the Post. Made out a new distribution of the loadings of the Boats. Mr. [William] Kittson will Embark in place of C. T. [Simon] McGillivray who resumes his Charge [of Fort Nez Perces].